The Buy Early Campaign is a partnership between the Department for Energy & Climate Change, ACRE, Citizens Advice and the Federation of Petroleum Suppliers and is promoted across the ACRE Network. 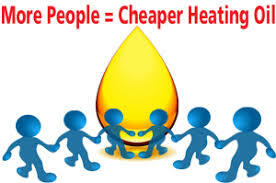 It encourages customers to buy their heating oil before the onset of cold weather and increased prices. It allows the oil suppliers to plan their deliveries better and ensure you get your delivery within 7 – 10 days. The sooner and faster you let us know you need oil or want to be included in the next delivery, the better. We can lose out on a good price waiting for everyone to get back with their required number of litres. So be pro-active and lets make the group buying power work. Please read this document for more information. Orders from the syndicate usually get a better rate than individual orders. We also work to get a deal that if the quoted price goes down before delivery, we get the lower price. Ideally we need a village delivery of 10,000 litres each time to command the best possible rates, without resorting to joining in with another fragmented group that maybe is commission led. The usual delivery tanker to the village will hold 10500 – 18000 litres, so you can see that its economic for the oil supplier to have one tanker deliver to the village, all on one day. That’s how they can offer us the best rates. It’s also better for the environment. Obviously, the more that come on board for any given delivery, the better, but it is a fact of life that we all have different sized tanks and use our oil at different rates, so we won’t all need oil at the same time. We do not charge or pay any commission but simply make would-be suppliers tender very competitive prices, so the more who order through the syndicate, the more everyone benefits. We also watch Brent Crude prices to see if prices are falling or rising. The minimum delivery to your house is 500 litres. There is no maximum, as they will just send our oil out in a larger tanker, so farmers can benefit, too. Payment is usually by card, over the phone, direct with the supplying oil company, unless you have a credit account. Although your payment details are taken before delivery, you will only be charged for the actual amount you receive, so if you were to “pay” for 1000 litres and they could only get 800 in your tank, ultimately you will only be charged for 800 litres. Simple. We don’t have fixed delivery dates. Just whenever there’s a need! By developing good relationships with our suppliers, we get preferential treatment, too. Even emergency deliveries! If anyone sees any problem with ordering through the syndicate (like access on the delivery day or paying in advance for their delivery), let us know and we will happily go through the way it can work for you and allay any concerns. It’s frustrating when there are insufficient volumes to obtain the best possible price, so if you need a delivery, please be sure to tell us how many litres you need and let us have your contact details. Thank you! Please contact me directly, or via our Contact page. ⟵Church Bells – Learn how to Ring!